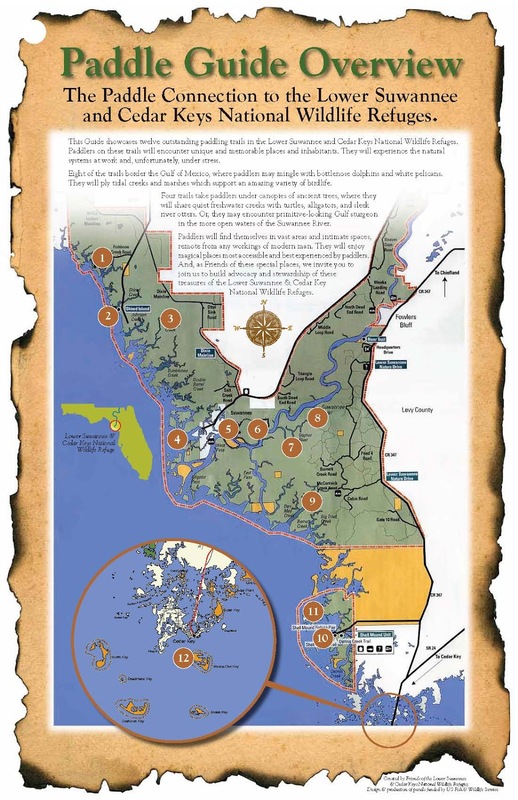 Those visitors to the Cedar Key area of Florida’s Nature Coast, who are prepared to travel by boat in search of naturalist adventures, should plan to explore the 13 islands or “keys” which collectively comprise the Cedar Key National Wildlife Refuge. These islands, which range in size from 1 to 120 acres, total approximately 762 acres; encircling the town and providing habitat for a wide range of native and migratory birds. The refuge, which is perhaps one of the least known refuges on the Florida Gulf Coast, is one of the largest nesting areas in northern Florida for a variety of species including white ibis, brown pelican, great, cattle and snowy egrets; great blue, little blue, tri-colored, and night herons; and the double-crested cormorant. Ospreys and bald eagles are common nesters spotted on the refuge as well. Cedar Keys is one of the few places on the Gulf of Mexico where magnificent frigate birds can commonly be seen soaring over the islands during the summer and fall months. Some of the more significant islands which make up this refuge and are prominent destinations for naturalist excursions include Seahorse Key, Atsena Otie Key, and Snake Key. Also known as “Shell Island“, Atsena Otie Key is the closest to the town and is easily accessed by kayak in the calm waters characteristic of this Gulf area. This island is often a popular destination for local residents and includes a dock, inland trail, primitive toilet and some sandy beachfront; making it one of the more welcoming destinations in the refuge. Click on this link provided by Florida Nature Guide to the Cedar Key NWRS Brochure provided by the National Wildlife Refuge System. Before planning a trip to the Cedar Key National Wildlife Refuge, it is advisable to contact the refuge administrative offices to determine if any planned activities are not permitted. Interior access to some of the islands is restricted to protect the nesting habitats of the residents dependent on this valuable resource. Seahorse Key is seasonally closed during breeding season (March – July), and has a significant number of venomous snakes at all times, so advance research is highly recommended for this destination. This link to the Cedar Key NWRS is provided here on Florida Nature Guide to assist those seeking adventures in this marvelous Florida ecosystem. The interactive map for Cedar Keys provided below can best be used to identify these islands by selecting a larger satellite view in Google Earth. The best way to explore Cedar Keys and much of the surrounding area is by canoe or kayak. Paddling in this natural undeveloped area can be a unique opportunity to observe wildlife and ecosystems unaffected by modern development. Additional opportunities nearby include the Lower Suwanee River area, and those seeking to explore a bit more of the Florida Nature Coast should check out this link to the Lower Suwanee NWRS page for more information. The Cedar Keys website has many valuable links and resources for those exploring the area in addition to local town businesses, etc. Follow this link to the Cedar Key Website for additional maps, information and advice about the surrounding areas. An additional resource for paddling adventures in both the Cedar Keys and Lower Suwanee River is the “Paddle Lower Suwanee & Cedar Keys Refuge” website. This site provides some excellent paddling guides for 12 identified trails, along with maps, photos, overviews, etc (see map overview). The site is easy to navigate and provides some great information to enhance your canoeing or kayaking adventure. Additional guide or recreational services are available for those uncomfortable with striking off into this natural treasure on their own.